Take the hassle out of replacing your Canon L1000 toner cartridges by shopping with Cartridge Save. In due course your Canon L1000 will polish off its printer toner, and when it finally happens you'll notice that replacement Canon L1000 toner tends to be costly. You do not need to be anxious about shelling out the high fees you'll see on the high street because here at Cartridge Save you can buy all the Canon L 1000 cartridges you will need at really small prices. Start saving money by purchasing online at Cartridge Save! You don't have to pay more for your L-1000 original cartridge or L1000 compatible toner in the high street when it's easy to save money ordering with Cartridge Save. You enjoy one hundred per cent confidence when you purchase Fax L1000 toner cartridges from us because every single one is covered by a no quibbles 30 day money back guarantee. Bear in mind that each and every order also comes with free delivery, generally arriving the next working day! The heavy-duty Canon L1000 laser fax machine is built for high-volume faxing. This robust unit has a large memory that can save 192 pages and can even be upgraded to 704 pages. The L-1000 fax printer has a Super G3 modem with a speed of 33.6 kbps and it uses laser beam fax with a maximum resolution of 600 dpi. The Canon L1000 can be upgraded to a network printer. It does not have standard PC connectivity. The compact Canon L1000 printer has a large control panel with organised function buttons, a numeric keypad, and monochrome LCD display. The maximum paper handling capacity is 1,100 sheets. The Canon L1000 mono fax machine has a scan speed of less than two seconds and it has speeds of 16 ppm. Transmission resolution can go as high as 16 pel x 15.4 lines / mm. The Canon L1000 mono laser printer is very easy to setup and it requires little maintenance. Users will have no trouble operating this unit. This reliable fax machine delivers decent-quality output and it is capable of continuously copying up to 99 pages. 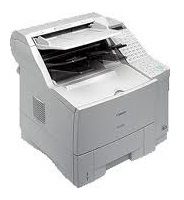 The Canon L1000 black and white fax has features including memory back up that can save up to 12 hours. Using recycled Canon L1000 fax cartridges in this machine makes it a lot cheaper to run. The L1000 fax would be better if the printer function and networking connectivity were made standard. The L-1000 laser fax needs faster print and copy speed. Some inkjets are faster. This model only uses a sheetfed scanner instead of a more convenient flatbed that can copy various originals.